Can't make the La Puente roast? There's one nearby, we bet. Roasting chile time arrives at Ralph's, Santa Monica Farmers Market, and Bristol Farms. Wineries dotting our nearby vino countries are starting throw a whole mess of pre-harvest parties, but we can see the fruits of autumn right here in the city. Yep, it's chile roasting time. We rhapsodized about the August Saturday meet-ups in the La Puente High School parking lot a few weeks back. 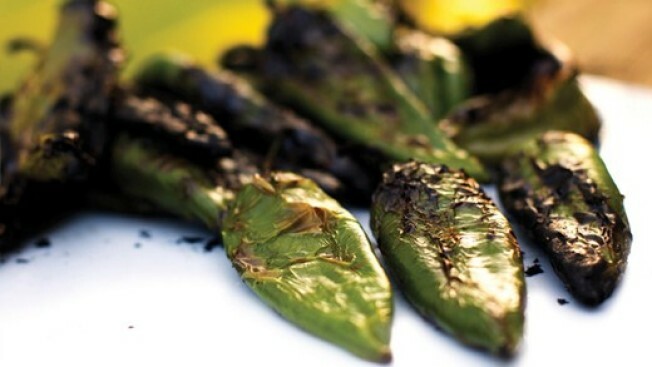 (El Rey Farms trucks in Hatch chile and roasts it in La Puente.) It's a nice scene, full of people from New Mexico, or people who like New Mexico. You have to wait a bit for your hot stuff, so it is a good time to chat people up. But chile roasting is springing up hither and yon. A handful of Ralph's will be roasting on Aug. 20 and 27, and Bristol Farms is taking it into September at its Newport Beach and South Pasadena locations. As Bristol Farms says "It's Now or Never." That's correct; if you want that certain smoky pepper, there's really only one time of year to get the fresh stuff. And if you're at Santa Monica Farmers Market on Saturday, Sept. 3, you'll get a whiff of the good stuff. Lots of roasting going down there, too. Yeah, we're obsessed. But chile lovers tend to go overboard when pursuing their pepper needs. It's one of the main things that unites the fiery fandom. The need to be roaster-side come August.